TUMEKE! : The Epsom equation: who do they hate most? Maori or bullies? The Epsom equation: who do they hate most? Maori or bullies? I was on backbenchers last night for their end of year special (it will screen Wednesday next week on tvnz7) with TVNZ's Jessica Mutch, Corporate lobbyist and man about Vegas, Mark Unsworth and Lord of the blog, David Farrar. I was saying Rodney Hide won't get elected because in the wake of the bullying revelations, my point being many professional women in Epsom would have suffered bully bosses and that would turn them off Rodney in light of his treatment of Heather Roy, David countered that Epsom female voters would be reminded that if Rodney loses, Hone Harawira will hold the country hostage. It poses an interesting question, who do female voters in epsom hate most? 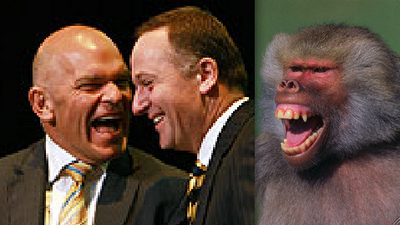 Bullies or Maori? I optimistically think bullies. Bullies are ok. But the old fear and loathing will always prevail in NZ. Unless they've dumped their culture and assimilated kiwily and quietly, I think Maoris. Oh Master, you are a card aren't you? You set up a hate site against me (your profile leads to it) and you have the audacity to lecture on presumptions? You are a laugh.